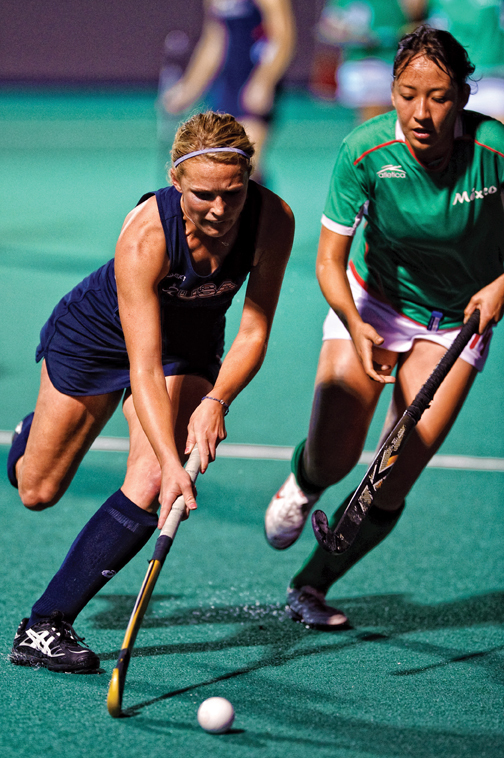 To control the ball with short strokes of the stick while on the move, alternating the ball from the right side of the body to the left side of the body in order to elude defenders. Any contact with the ball using a swinging motion of the stick. This stroke is used to make long passes or take shots on goal. Scoop The lifting of a stationary or slower moving ball off the ground by placing the head of the stick slightly under the ball and shovelling the ball forward. 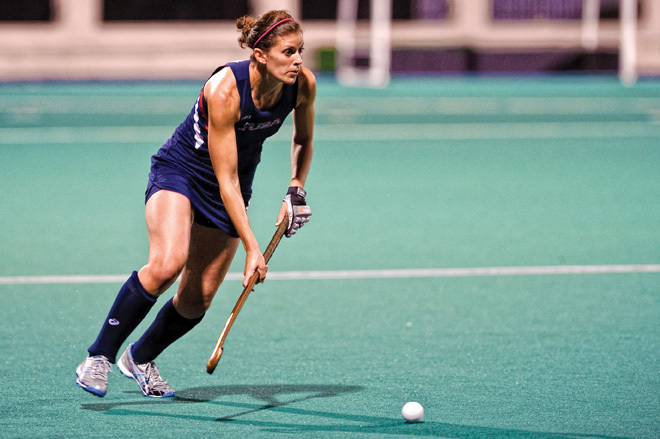 An attempt to steal the ball away from the opponent by using the stick. A foul in which a player pushes, shoves, or advances the ball in anyway, using their body, hands, or feet rather than the stick. A defensive pass to send the ball backwards to help the attacking team get the offense in place before moving forward on attack. Keeping the ball in possession so that it is difficult for the opponent to gain control. To position oneself between an opposing player and ball. Any intentionally rough or dangerous play. The player is issued a red card and ejected from the game. Passing technique whereby the player passes the ball and then immediately sprints to receive a return pass. To poke continuously at the ball in an attempt to make the attacking player lose possession. One-on-one defense by staying close to the attacker. Also known as man-to-man defense. An infraction for using the body or stick to prevent opponents from pursuing the ball. All players must have an equal chance to gain control of the ball as it is dribbled or passed down the field. The goalkeeper will be charged with obstruction if they lay on the ball. To turn the stick so that the blade points to the right, allowing a hit or push in that direction. Using peripheral vision to assess options while in possession of the ball. A player taking a free hit, center pass, long corner, or sideline re-start can be the next player to play the ball - a “self-pass”. Taking the free hit and the next playing of the ball must be two distinct and separate actions. The ball does not have to move one meter before they play the ball again. Pass sent parallel to the endline. The formation of players on the field representing a balance of attack and defense. 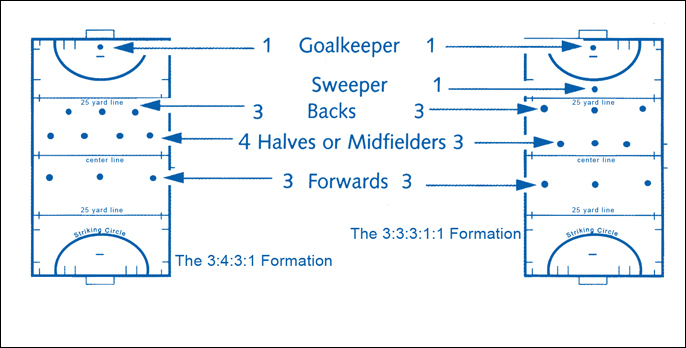 Sample formations from attack to defense: (forwards, midfielders, defenders, goalkeepers) 3-4-3-1, 3-3-3-1-1. A term used to describe the way in which a team wants to play in a game. Tactics can apply either to defensive or attacking formations and methods of play. When an attacking team player passes the ball between defenders to a teammate. Spreading the attacking players across the width of the field in order to draw defenders and to create space for scoring opportunities. A defensive tactic where players on the defense are responsible for guarding specific zones or areas of the field. The defensive player is responsible for guarding an attacking player who comes into their area or zone.